On 1 January this year, the deeming rules for Account Based Pensions changed. Here’s what it could mean for you. Instinctively, most of us feel a belly laugh is good for our wellbeing. And increasingly, scientists are backing this up, confirming laughter has many physiological and psychological benefits. Given the Aussie's have just been crowned World Champions for One Day Cricket and the AFL launches it's season this weekend - it is only fitting we share a fun fact that links these two sports together. This is a MUST READ for anyone who is an existing member with RACQ. Steve Kelly has provided a brief summary of the upcoming RACQ Annual General Meeting that is being held at the Sofitel Hotel in Brisbane next Thursday 20 November at 2:30pm. Steve offers his viewpoint on what effect the proposed changes will have on current members with RACQ and what you can do now to have your say as an existing member. NOTE: If you plan to take action you must return your Proxy Vote to RACQ by Tuesday 18 November by 2:30pm. There’s no doubt that travel is one of the most highly anticipated events. You finally have the time to follow your dreams and explore new and exciting places. Whether it means jumping in the car and hitting the road to explore new parts of Australia or international travel, it always pays to plan ahead. 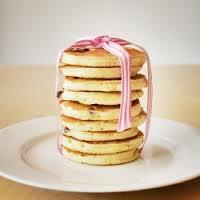 When you've run out of ideas Pikelets is it, everyone has all the ingredients in their cupboards. Most of us don’t look forward to tax time. But it doesn’t have to be difficult. By getting organised early, you can save time, claim all the deductions you’re entitled to — and even get your return paid faster. Today is the day to: stop, take stock and tackle your finances head on. Is it always tomorrow, next week, next month or next year that you’re going to get your finances in order? It’s important to get on track as soon as possible. Here are some important things to take into consideration. Are you renting or have you rented in the past? Chances are you might be owed some bond money. Talking to your loved ones about money can be one of the hardest conversations of all, as well as the most important. Here are some tips for those difficult financial conversations. Christie asks: My partner and I are planning on starting a family soon and have heard the baby bonus will be abolished. How will this impact us? Christmas wouldn't be Christmas without rum balls. Here's a quick recipe for anyone to put together to contribute to the family festivities. Are the rules you live by doing you more harm than good?